This slim volume is a compilation of some of Fr. Joe Maier’s guest columns in the Bangkok Post and was published last year (ISBN 974-228-026-6) in Bangkok. It deals with life in the slaughterhouse slums of Klong Toey, an area that is very well known to Fr. Joe Maier, who has lived and worked with the slum dwellers for 30 years. The lives of the children in Klong Toey are ones that you will barely be able to comprehend. It is an environment that almost defies description, but author Fr. 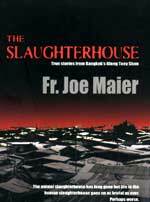 Joe Maier manages to do this in a non-critical way, using very simple English that reeks of poignancy, but a word of warning before you begin, this is not a book for the squeamish. The tales describe one horror after another, but are not told in a melodramatic manner. It is now, and it is real life situations. Drugs, AIDS, orphans, alcohol, paedophilia, drugs, drug courier abused children, lice, vermin and filth. It is all there. Fr. Maier has written eloquently of the plight of the children under his care, but not in a begging manner. In all the awfulness, he manages to (somehow) retain his own vision and spirit and obviously provides something of a rock for the people with no past, no possessions, no education and generally no future. It is of a different society that Fr. Maier writes. A society that is beyond our ken. A society where some mothers are selling their daughters and cursing their 12-year-old children for only bringing back 300 baht. A society that puts oppression on their own children to control them, and yet, somehow, some of them survive to grow up as normal human beings. But only a few. Those who do often come back to the slaughterhouse environment to assist the other inmates. Those who are born in the slaughterhouse are almost fated to die there. One way or another. Many of the tales are absolutely gut wrenching. The poverty is abject and the abuse mind numbing. The only positives that are evident are some vestiges of community spirit that exists in such a closed neighbourhood. There are very few people to whom these slum dwellers can turn, and officialdom has done them no favours. Even the “Uniforms” look upon the place as one to exploit those who will never be able to get out of it. The book has an RRP 250 baht, and for a primer on “real” life in the slums it is a bargain. At the back of the book is a description of the work done by the Human Development Foundation (HDF), a non-profit group that provides kindergartens, teachers, shelters, Aids centres, social workers and perhaps a glimmer of hope for the thousands living in Bangkok squalor. Especially for children. There are contact numbers given for the organization. Buy the book just to get the contact information. One or two stories will be enough to make you weep. Three or four will make you want to rise up and fight. The entire book will make you want to contact the HDF. Do it! Every time that Hunter and Ronson got together to make an album’s worth of material there was always a lot of magic in the air. Unfortunately this only happened three times. Once for Ian Hunter’s first solo album in 1975, then four years later in 1979 with the fabulous “Your never alone with a Schizophrenic”. It was not for another eight years that the two of them finally got back together again. The recording process was only undertaken after the band had been on the road for six months with a set that included nearly all the material to be recorded for “Yui Orta” (the title being a play on the old “Three Stooges’’ catchphrase). So if there is a live feeling to this album it is hardly surprising. With producer Bernard Edwards at the controls, the whole album was recorded over a seven week period at the Power Station in New York City. Hunter’s song writing throughout is nothing short of superb, but the overall feeling of greatness that is put across cannot be laid entirely at the songwriter’s feet. The rest of the band is so tight they make identical twins seem like strangers. Micky Curry plays the drums as though they are a lead instrument instead of a time keeping device. Pat Kilbride really comes of age here as one of Rock’s leading bassists, keeping the groove of the album going in one continuous whoosh. The great Tommy (Mad Dog) Mandel handles the keyboards, and is best served whilst bashing out the rhythms on piano, which always suited Hunter’s songs the best anyway. Here Mandel can be heard at the height of his powers before he was later submerged in the Bryan Adams Band. Then, of course, on every instrument with six strings there was Mick Ronson. (In many people’s opinion Bowie has done nothing of real merit since he parted company with his main collaborator when he split up “The Spiders from Mars”.) Whether playing some quiet tasteful licks behind Hunter’s ballads like ‘Livin in a Heart’, where Hunter sings of the regrets he harbors for the break up of his first marriage and the guilt that he feels, or the straight ahead party time Rock ‘n’ Roll of ‘Big Time’, every note is perfect, making each song come alive. Add to this some of the finest songs to come from the pen of Ian Hunter, during his long and illustrious career, you have here an album worthy of the tag ‘Milestone’ in Rock ‘n’ Roll. Nowhere will you find a finer rapid fire salvo of opening tracks than ‘American Music’ with it’s references to British radio, which only played Rock ‘n’ Roll music very occasionally in the late fifties and early sixties, and completely at random, so you had to listen to an awful lot of dross whilst hoping for a bit of Jerry Lee Lewis. Follow this with ‘The Loner’ (one of Hunter’s favorite songs) and then the hard rock of ‘Women’s Intuition’, a song of vengeance concerning the theme of injured love. You are left breathless by track four. And believe me, there is a lot more to come, including this Dog’s favorite ever Hunter song, the gut wrenching ‘Beg a Little Love’, plus the album’s closing song, a guitar instrumental of the Don Gibson song ‘Sweet Dreamer”, which was originally a hit for Dolly Parton, but in the hands of Mick Ronson it becomes a thing of rare beauty. 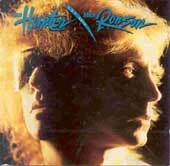 With Hunter’s redoubtable song writing skills and idiosyncratic vocals, the snap, crackle, pop, and flash of Ronson’s guitar playing, this album is a timely reminder of the talents of two of rock’s mavericks, whose influence is still recognized by many of today’s young Buckaroos. When all of my minds had gone”.